On one level, the vote to ban minarets in Switzerland is a triviality. The constitutional amendment does not ban mosques, it does not pull down the country's four existing minarets, nor does touch the practice of Islam in Switzerland or bear on the many issues concerning Swiss Muslims. In all likelihood, the political establishment in Bern, which abominates the amendment, will find some way to overturn it. But on another level, the 57.5 to 42.5 percent vote represents a possible turning point for European Islam, one comparable to the Rushdie affair of 1989. That a large majority of those Swiss who voted on Sunday explicitly expressed anti-Islamic sentiments potentially legitimates such sentiments across Europe and opens the way for others to follow suit. That it was the usually quiet, low-profile, un-newsworthy, politically boring, neutral Swiss who suddenly roared their fears about Islam only enhances their vote's impact. Nov. 30, 2009 update: Responding to this analysis, Matthew Yglesias of ThinkProgress writes that I see it as "a good thing" that the Swiss explicitly expressed anti-Islamic sentiments. I do? I did not write that. My intent in this brief comment was objectively to note the impact of the Swiss vote, not to condemn or condone it. Re-read my words and that is what you find there, with no hint of my personal view about the vote being "a good thing" or even a bad thing. Comment: Yglesias' manipulation of my words fits into a long and ignoble tradition in which Leftists distort my words or my intent. I collected some of the most egregious examples at "Mangled by Leftists and Islamists." Dec. 9, 2009 update: (1) A scientific poll of Belgians sponsored by Le Soir weekly and carried out by iVOX finds that 59.3 percent of the Belgian population favors a Swiss-like prohibition on building new minarets and 56.7 percent want to ban the building of mosques. The poll of 1,050 persons was taken on December 3 through 5 and has an accuracy of within 3 percent. (2) For other European opinions, see here and here. (3) Publication of this article prompted mail with other examples of non-reciprocity. James Caplan of Philadelphia informed me about his offer in 1999 to erect an abstracted Star of David on the roof of the copula of Synagoge Beth-Hamidrasch, the main synagogue in Frankfurt Germany. He relates that the rabbi turned him down, saying he did not want to invite trouble with the local Muslim population. A Christian prelate writes me from Turkey: "There are no Swiss church towers in Turkey despite a friendship between the two nations for hundreds of years. … The 430-year old Anglican Chaplaincy in Turkey once was a symbol of Turkey s advances of 19th century but now has a crumbling tower (The Crimean Memorial). Likewise, other churches in Turkey endure endless struggles to get restoration permits." (4) I elaborate on this topic in my column out today, "Swiss Minarets and European Islam." 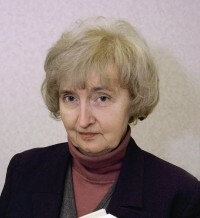 Anne-Marie Delcambre, French specialist on Islam. Dec. 10, 2009 update: Anne-Marie Delcambre, the eminent French specialist on Islam, writes in "Faut-il interdire les minarets" that "paradoxically, the quiet Swiss who don't want to be talked about, will go down in history as the ones who dared to say "Stop" to the spread of Islamic or Islamist ambitions" ("paradoxalement, ce peuple suisse, tranquille, ne cherchant pas à faire parler de lui, restera dans l'Histoire comme celui qui a osé dire halte à la progression des revendications islamiques ou islamistes"). While Muslim leaders criticized the Nov. 29 vote in Switzerland that banned construction of minarets, they don't support Christians who want to build churches in some Islamic countries. Restrictions in Egypt have exacerbated sectarian violence and discrimination, say Copts, a 2,000-year-old denomination that comprises about 10 percent of the population. The day after the Swiss vote, Ali Gomaa, one of Egypt's top Muslim clerics, called the decision "an attempt to insult the feelings of the Muslim community in and outside of Switzerland." Copts quickly said that neither Gomaa nor any other Islamic leader mentioned the Christian situation in Egypt. "Without the merest attempt to put our house in order, are we in any position to taunt others to put theirs?" Youssef Sidhom, editor-in-chief of the Cairo-based Egyptian Coptic weekly newspaper El-Watani, said in a telephone interview. "They should be ashamed." There are about 40 Coptic churches in Egyptian cities and scores more in towns and villages, especially in south Egypt, along with larger numbers of clandestine prayer houses, said Bishop Thomas, a Coptic priest who operates a retreat outside Cairo. Parallel to these incidents are clashes over such issues as conversion and alleged harassment of Muslim girls by Copts and Coptic girls by Muslims. "It's a challenge to hold onto the concept of love and peace," said Thomas, 52. After he founded his retreat 10 years ago, Muslims set up four small mosques, complete with minarets—towers from which Muslims are called to prayer, just outside the four corners of the rectangular enclosure. "They make a point that if we are here, the Muslims must be, too," he said. Requests for interviews with government officials and state-controlled Al-Azhar University in Cairo, Egypt's largest institution of Islamic learning, went unanswered. Requests for interviews at the Islamic conference's Geneva office, which issued the criticism of the Swiss ban, were rejected because officials were too busy, said a person who answered the phone there. Nor is this hypocrisy limited to Egypt. The Organization of the Islamic Conference condemned the vote in no uncertain terms ("The decision of the Swiss people stood to be interpreted as xenophobic, prejudiced, discriminative and against the universal human-rights values") even as many of the 57 member states disallow equal rights for non-Islamic faiths. Members include Saudi Arabia, where non-Muslims are arrested for worshipping privately; Maldives, the Indian Ocean atoll where citizenship is reserved for Muslims; Libya, which limits churches to one per denomination in cities; and Iran, where conversion from Islam is punished by death, according to a 2009 U.S. State Department report on religious freedom. Dec. 25, 2009 update: The Associated Press carries an article, "Vatican's top cleric in Arabia walks a thin line" by Barbara Surk, that amplifies on some of these points. 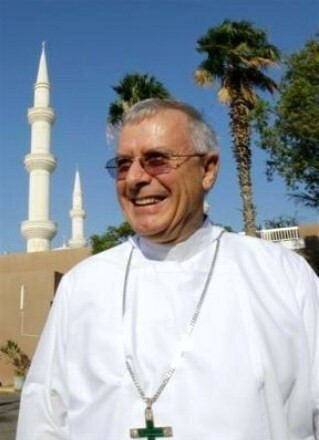 It tells about Archbishop Paul Hinder, the top Roman Catholic cleric to the approximately 2 million Catholics resident in six countries (Bahrain, Oman, Qatar, Saudi Arabia, United Arab Emirates, and Yemen) on the Arabian peninsula. Yemen is the only country under his purview that had indigenous Christians. Except for two priests, however, all of Yemen's 10,000 Christians, most of whom lived around the southern port city of Aden, were driven out during communist rule in South Yemen in the 1960s. Four old churches are slowly being restored there, though it is not clear how many indigenous Christians have returned, if any. The first Catholic church in the Gulf was opened in Bahrain's capital, Manama, in 1939. Now there are seven in the UAE, four in Oman, three in Kuwait and one in Qatar, where five churches of other Christian denominations are under construction. … inter said he is careful not to do anything that could be construed as proselytizing or seeking conversions - a major taboo in Islam. Hinder travels to Saudi Arabia "several times a year, but only as a private citizen, not as an archbishop." Jan. 26, 2010 update: An analysis of the minaret vote by "Vox Analysis" concludes that it concerned the spread of Islam rather than reflecting a bias against Muslims, much less foreigners in principle. Hans Hirter of Bern University explained that "For many voters it wasn't against Muslims in Switzerland." About two-thirds of "yes" voters consider Swiss and Muslim lifestyles to be compatible. About 40 per cent of them favor equal opportunities between Swiss and foreigners. 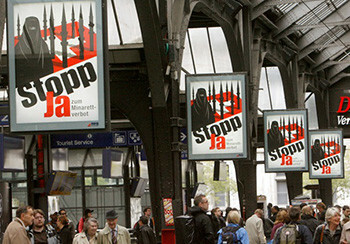 The most popular reason (24 percent) to vote in favor of the ban was "The minaret is a symbol of Islamic supremacy"; the ban's supporters primarily wanted to make a "symbolic gesture" against the spread of Islam in Switzerland. About 16 percent wanted to respond to the discrimination against churches in Muslim-majority countries.